One of Gigatron's twisted schemes involved corrupting a stolen Cybertron (Autobot in English dub) Cyberdrone (Protoform in English dub) with Combatron (Decepticon in English dub) programming. In the process, the Cyberdrone scanned some attributes of Fire Convoy, but the Combatron programming held—and Convoy's dark doppelgänger Black Convoy (Scourge in English dub) was born. Black Convoy is arguably Gigatron's second-in-command, leading the new Combatron forces, a much more effective unit than Gelshark's Destrongers. He is a ruthless and cunning warrior who contains all of Fire Convoy's strengths and skill, but none of his compassion and mercy. He's also a very ambitious warrior, with plans to dethrone Gigatron! Black Convoy's greatest strength is also his weakness—his temper. Fearless and furious, he charges into battle wildly hacking his broadsword as his trailer combat deck launches missile barrages overhead. Yet his rage also makes him impatient, petulant, and easily provoked; it also scares the heck out of his subordinates. Naturally, Gelshark sees Black Convoy as a threat on just about every level. For once, he is right. Black Convoy was one of a crew of six Cybertrons sent to Earth to reactivate the legendary Cybertron (faction) battle fortress, Brave Maximus (Fortress Maximus in English dub). 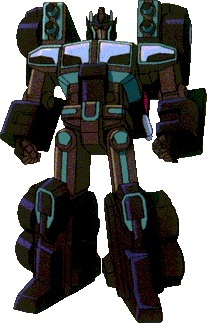 As leader, Black Conboy was equipped with the ability to detect the unique energy signatures of the O-Parts, the Cybertronian components that held the key to Maximus' awakening - but he was never given the opportunity to use that ability in the service of the Cybertrons. With all six members of the crew held in stasis pods in Cyberdrone state through the long journey, their craft malfunctioned and crashed on Earth in the mid-20th century, and the Cybertrons joined Maximus in slumber. In the present time, archaeologist and energy expert Dr. Daichi Ohnishi's research eventually led him to the various links in the chain of Brave Maximus - he located the fortress itself beneath Earth's surface, mapped the location of the O-Parts, and discovered the location of the crashed Cybertron (faction) spaceship. However, when the evil Gigatron came to Earth with the intent of harnessing Maximus' power, he captured Daichi Ohnishi, and through mental scans, discerned the location of the Cybertrons' ship. Stealing the six Cyberdrones, Gigatron took them to a nearby military base to scan vehicle modes for them, infusing them with a part of his own spark energy to turn them to the side of evil. With an infusion of Gigatron's spark energy to complete the concoction, Black Convoy was born, emerging from his pod as a dark twin of Fire Convoy, who proved that Gigatron's programming had over-ridden any Cybertron (faction) goodness within him.